Hi! Thank you both for answers. No! I didn't bought it. I knew that something was "fishy", but did not knew what, that's why I have asked. Have a nice day and thank you again for your help. Hello! I found this article on sale as military knife, and as I searched for information, I found that it may be British. Can someone please confirm that is a British ww2 fighting knife? Thank you. Hello gentlemen's, I really need your help in this matter. I don't know if is the right place to post this but I don't know where else to post it. It appears to be a cup prize for shooting, given by some soldiers to someone... Does anybody know more about this item/s? Any information will be more that wellcomed. Thank you, Alex. Hi Peter, I hope that my post doesn't come to late. the ribbon bars dont belong to the same person or is a low chance that to happent. the first ribbon bar, belonged to a military person, an officer. is a war ribbon bar which contains the following: 1. order of the star of romania on military virtue ribbon, officer degree, 1877-1932 modell; 2. order of the crown of romania on military virtue ribbon, officer degree, 1881-1932 modell; 3. russian order of st. anne, war type, 5th or 4th class; 4. romanian commemorative medal for the balkan wars 1913-1914 "trecerea dunarii"; 5. wwI commemorative cross 1916-1918/'19; 6. 40 years carol I jubilee medal; 7. 25 years in military service. obvious a miltary personell ribbon bar. 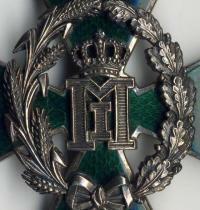 second one belonged to a civil person, containing the following orders and medals: 1. order of the star of romania, knight degree, on original order ribbon, 1877-1932 modell; 2. order of the star of romania, officer degree, on original order ribbon, 1881-1932 modell; 3. unknown order, officer degree; 4. medical merit order, peace time ribbon; 1913-1947 modell, most likely awarded between wars; 5. wwI victory medal; 6. commemorative medal of Carol I, 100 years from it's birth; 7. romanian commemorative medal for the balkan wars 1913-1914 "trecerea dunarii"; 8. wwI commemorative cross 1916-1918/'19; 9. medal for comercial and industrial merit, 1912-1947. a civil ribbon bar. both are looking good and original. best regards, Alex.B. Romanian Michael The Brave Order items. Hello all, Mr. Heusy68, I am interested in more details regarding your Michale the Brave order shown above. Do you still have the order? any findings regading the manufacturers name? does it have a mark on the body of the order? thank you, best regards. Alex.